If you ever played sports on a playground as a kid, you know the way team selection often works on children’s playgrounds. Two kids get selected as team captains, and then all the other kids line up in front of them, and those two kids take turns choose who they want on their team. Is this how it worked on playgrounds when you were a kid? Did you ever get chosen first? Do you remember how great that felt? Did you ever get chosen last? Do you remember how bad that felt? When I was growing up, I wasn’t the most athletic kid in the playground, but I also wasn’t the most unathletic. This means that while I almost never got chosen first, there was never a time that I got chosen last. I very clearly remember being so grateful for that. There was this kid named Michael in my class who almost always got chosen last. He was pigeon toed and had big, thick glasses, and was super uncoordinated. And I remember watching him, eyes downcast, staring at his feet, pushing dirt around with the toe of his shoe, and then finally, when everyone else had been picked, the team that got stuck with him said, “Ok, fine. I guess Michael’s on our team.” And all the team members groaned. I remember being so glad I was not Michael. It feels good to be chosen. It feels bad to never be chosen, or to be chosen last. Today, we are going to talk about election, which is a fancy, theological word for “chosen,” and we are going to talk about how God chooses people to be on His team, and how you can make sure that when it comes to being chosen to play on God’s team, you can make sure that you are chosen first. Not last; not in the middle, but first. Our team captain is Jesus, and He wants to choose you first. We’ll see how that happens today. As we gear up for this, I want to make sure I state right from the start that I believe in election and predestination. It is a Biblical truth that cannot be ignored or refuted. However, I want to say right from the beginning that I also believe that the two most common theological systems in regard to election and predestination are both wrong. These two systems are most often known as Calvinism and Arminianism. Calvinism is named after the Reformer John Calvin, and Arminianism is named after the Reformer James Arminius. Most people believe that you have to be one or the other, a Calvinist or an Arminian. But having carefully studied both, I am proud to say I am neither. I’m not even a mixture of the two—a Calminian, as some like to say. What I am, I don’t have a name for—other than Christian— and I know of many out there who believe just as I do regarding this issue. Most people think the whole debate between Calvinism and Arminianism revolves only around the issue of election and predestination. There is a lot more to it than that. For many years I was a 5-point hyper-Calvinist, and I would love to share with you what I have learned since then. But we do not have space here. Ephesians 1:3-14 are all one long sentence in the Greek. So really, it should all be looked at in one piece. But our western, English-speaking minds have trouble grasping such a long sentence, so the translators of our Bibles have split it up into more manageable sections. Overall, the flow of this sentence is that we have spiritual riches from God the Father (Ephesians 1:4-6), from the Son (Ephesians 1:7-12) and from the Holy Spirit (Ephesians 1:13-14). Ephesians 1:3 is a summary of chapters 1, 2 and 3. It is kind of the thesis sentence. Paul begins with praise to God for these spiritual blessings. And Paul tells us where these blessings are – in the heavenly realms. These are not earthly treasures which moths and rust destroy and which thieves break in and steal; these are real, everlasting heavenly blessings. Remember several years ago when clothes and appliances and tools all had the “Made in America” stickers on them? Supposedly, they were better made and more durable than foreign made products. I suppose that could be debated, but Paul’s point here is that these blessings we have are stamped with a seal that says “Made in Heaven.” These will last. Ephesians 1:4. just as He chose us in Him before the foundation of the world, that we should be holy and without blame before Him in love. This is a key verse in the Calvinism/Arminianism debate in regard to election. Some notice that the term election in not even in this verse. In fact, the word election is not found in the entire letter of Ephesians. But since “to elect” simply means “to choose,” I believe we can take this passage as a key text on election and predestination, because the term “he chose us” is found in this verse. Since being chosen is in view, there are three questions we can ask which will help us understand the text – and all texts similar to it. First, who is chosen, and second when are they chosen, and third, why are they chosen? Let’s answer them one by one. The text says he chose us in Him. The phrase “in Him” tells us that this blessing of being chosen is something that we have in Christ. Christ is the first chosen person. Christ is the choice servant of God (cf. Luke 9:35; 23:35; 1 Peter 2:4, 6). Most people teach that election and the choice of God has to do with God deciding which unsaved sinners He wants for Himself. But right away, we see problems with this, for Christ is the first chosen one, and He was not an unsaved sinner. Whether or not it is true that God chooses to save some unsaved sinners, we see already that, at least with Jesus, the choice or election of God is not always of unsaved sinners to salvation. God’s first choice was Jesus Christ. Ephesians 1:4 shows us furthermore that when God chose Christ, He also chose us. Whom does the “us” refer to? From Ephesians 1:1-2, they refer to Paul and the believers to whom he was writing. In verse 3 the word “us” refers to those who are blessed in the heavenly realms. In verses 6, 7 and 8, “us” refers to those who have received the riches of God’s grace. So whom does the “us” refer to? It cannot refer to anybody but those who are already Christians. 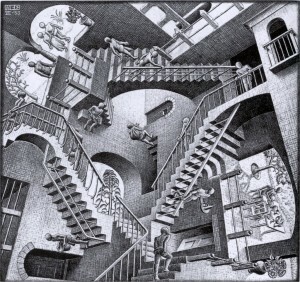 So here we see exactly the same thing we saw with Christ. Christ is the eternally begotten Son of God, and God chose Him for a special task. But in choosing Christ, God also chose those who are in Christ—in other words, Christians. This verse does not teach that God chose unregenerate people to become Christians. This verse teaches that God chose Christians. Sometimes, in trying to understand a verse like this, it helps to look at what it is not said. If, as many teach, God chose those whom He would save, and either passed over the rest (single predestination) or actively chose to send the rest to hell (double predestination), then this verse should say “He chose us to be in Him.” If God chooses some of the unregenerate to be regenerate, then this verse should say that God chose us to be in Him. But that is not what it says. It says, “He chose us in Him” not “He chose us to be in Him.” Whatever this choice is, it was done when we are already in Christ. Christ and Christians are the chosen ones, but the emphasis is on Christ. Jesus ultimately is the chosen one, and by nature of being in Christ, we were chosen because He is chosen. The only individual chosen in Ephesians 1:4 is Christ. When we place faith in Christ, we are placed “in Him” and so become chosen in Him because He is chosen. In other words, Christians are elect because we are in Christ and He is elect. Only those who are in Christ can be referred to as elect or the chosen in Christ. God’s choice of Israel in Abraham is revealing, though not exactly parallel. Abraham was chosen by God to be the father of the elect nation Israel. Because all Israel was in Abraham’s loins and would come from Abraham’s seed, they too were chosen by default because he was chosen, and they were in Abraham at the time he was chosen. But while Abraham was chosen at a point in time, Paul goes on in verse 4 to state when Jesus Christ was chosen. This is the next question we want to ask the text to help us understand what election is. 2. When Did the Choice Occur? The next phrase in Ephesians 1:4 is before the foundation of the world. Since the primary chosen one is Christ, the primary focus of this phrase is also Christ. It is Christ who was chosen before the foundation of the world. This means that before the world was ever created, Jesus Christ was chosen, and by inference, all who would eventually be placed “in Christ” by faith in Him were therefore also chosen. So this choice took place in eternity past, before the foundation of the world. This then leads to the third question about election, which is the most important of all. 3. Why Were They Chosen? 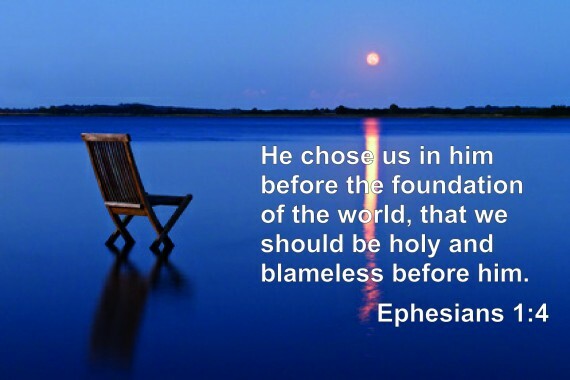 He chose them, according to the end of Ephesians 1:4, so that we should be holy and without blame before Him in love. This is a task believers are to strive for and a future that God guarantees. Notice that there is nothing in this verse about God choosing some to receive eternal life, while leaving all others to be damned—as the Calvinists teach. Neither is there anything about God looking ahead in time to see who would believe in Him for eternal life and then choosing them—as the Arminians teach. There is nothing of either teaching here. Paul says first, that those who are chosen are those who are in Christ. In other words, only believers are chosen, and they are not chosen to receive eternal life—they are chosen to fulfill a task or purpose. As Paul describes it here, they are chosen to be holy and blameless! Let me state it more bluntly. Election is never to eternal life. God chooses certain individuals for a task, not for eternal life. The people of Israel are the perfect example. God chose Abraham, and in choosing Abraham, God also chose all the people who could come from Abraham, namely, all the people of Israel. So let me ask you, were all Israelites the chosen people of God? Yes, they were. But did all Israelites have eternal life? No, they did not. So you see that even with the people of Israel, election does not mean that God decides to give eternal life to some people. All Israel was elect, but not all Israelites had eternal life. What this means is that election has nothing to do with who has eternal life and who does not, and everything to do with God’s choice of certain people and nations to perform certain tasks and purposes in He plan for the world. Judas is the perfect example. Did you know that Judas was chosen (John 6:70)? But most believe that Judas did not have eternal life. Therefore, how can we say that Judas is chosen? We must say that he was chosen, not to eternal life, but to fulfil a certain purpose or task. And that makes perfect sense with what we see Judas do in the Gospels. Both Abraham’s election and Christ’s election and all those who were in Abraham and all those who are in Christ are chosen, not to salvation, but to a task. Now, here is one distinction I want to make. While not everybody is chosen by God, that is, while not everybody has a specific task within God’s plan and purpose for the world, all Christians have been “chosen” in Christ. This is Paul’s point here in Ephesians 1:4. Though not everybody is chosen, all believers are chosen, because we are in Christ, and He is the chosen one. The first three chapters of Ephesians are all about the blessings and privileges we have as members of the family of God. And as I indicated already, Ephesians 1:4 is the introductory summary statement of all these blessings and privileges. Paul states that source of these blessings and privileges is found in the fact that we are in Christ, and since Christ is the ultimate “Chosen One,” we who are in Christ are also therefore chosen in Him. Jesus Christ has the most important role and responsibility in God’s plan and purposes for this world, and since you and I are in Jesus, we get to participate with Jesus in that plan and purpose. This is what it means to be chosen in Him. God’s choice has nothing do with who will go to heaven and who will be sent to hell, of who has eternal life and who does not. His choice in Ephesians 1:4 and He chooses them to perform tasks while we are here on earth. God chooses Christian men and women to perform a task. A study of God’s choosing and election throughout Scripture will reveal the same truth. God does choose. He does elect. But never to eternal life or eternal death; He chooses groups or individuals for certain tasks. This also makes sense of His choice of Abraham and the Israelites, his choice of King Cyrus, His choice of the twelve apostles including Judas, and His choice of Christians. Some of those He chooses do have eternal life, but some of them will never have eternal life. Of course, all who have eternal life are also chosen. And all who are chosen, or chosen to perform a task in God’s plan and purpose for this world. With this view, even unregenerate people, like Pharaoh, Cyrus, Judas, and the Jewish people can be chosen, even if they never received eternal life. The question left though, is “How do we receive eternal life?” If God does not elect certain ones to receive eternal life, and if all who have eternal life, are also the ones who get chosen by God to perform certain tasks, how does one receive eternal life? If God doesn’t choose who has eternal life and who does not, how then do we receive it? Well, as Scripture reveals all over the place, we receive eternal life by believing in Jesus for it. What this means is that if you want to be chosen, if you want to picked, if you want to be on God’s team so that you can play in the game of life and accomplish God’s plan and purposes for this world, you do not have to wonder whether or not God has chosen you. If you believe in Jesus for eternal life, then you are chosen. All who are in Christ are also elect in Christ. So if you want to be elect, if you want to be chosen, then all you need to do is be in Christ, and this accomplished by the Holy Spirit when we believe in Jesus for eternal life. It is a wonderful blessing to be chosen by God for a task. It reveals to us that we are special to God and that He wants us on his team. If you have ever followed the NFL draft, you know that NFL teams draft members onto their team who will fill in the holes, or replace members who have retired or moved to other teams. If their quarterback has been getting sacked a lot, and they need to beef up their offensive line, they will draft big, strong linemen. If their passing game is not that good, they will draft a wide receiver. If other teams are able to run the ball a lot against them, they will draft some good defensive players. And in such drafts, there are always first round picks, second round picks and so on. The teams try to pick what they need the most. Guess what? God too has a team, and it is going to win the Super Bowl, and you are on that team to fulfill a specific purpose. He has chosen you, drafted you, for a certain task. You are a first-round draft pick. If you listen to Him, and go to training camp, and work out with the team, and attend practice, you might even be in the starting line up. Do you know why you are on His team? Do you know what special abilities and talents you have which make you special? When you discover and use them, life will become significant and meaningful. This is the task you were chosen for. This is the role you were meant to fulfill. Jesus is our team captain. He was chosen to be the team captain before the foundation of the world. But all who are in Jesus Christ by faith in Him, were also chosen to play on God’s team, and this choice also happened before the foundation of the world. This means that if you are a believer in Jesus for eternal life, you too were chosen in Jesus before the foundation of the world. You too were chosen first. This means that you are the star player on the team. You are the one with the special skills and abilities. You are the one who will help us win the game. The rest of Ephesians explains how you will do this. The rest of Ephesians explains what your roles are, and what tools God has given you to perform these tasks. Please join us so you can know what God has given you and what he want you to do. For more reading on this subject try: The Other Side of Calvinism by Laurence Vance, Beyond Calvinism and Arminianism by C. Gordon Olson, The Dark Side of Calvinism by George Bryson, Calvinistic Paths Retraced by Samuel Fisk, Election and Predestination by Samuel Fisk, and God’s Strategy in Human History by Paul Marston and Roger Forster. Vance, The Other Side of Calvinism, 357. Olson, Beyond Calvinism and Arminianism, 188. It’s amazing to me that we have both reached the same conclusion about this , arriving at the same place from two completely different beginnings. Thanks for sharing this. Thanks, Michael. Any good resources that helped you come to your conclusions? Very good Jeremy Myers…very good. Thank you for researching and studying this. Ha! This may be the shortest comment I have ever received on this blog. I <3 it! Love your stuff! Keep it coming……..
Jeremy– this is an excellent article. Many of these issues you have expressed I have been working through myself in my own study and thinking. Your blog encouraged and clarified because I am still working through these issues. I tell others that I am neither Calvinistic or “Arminianistic” but biblical. Hope that does not sound too prideful because it meant to be honest. i have a sincere quest ion i am not trying to be critical in any way do you believe there is a hierrchy in the Godhead?? A hierarchy? No, probably not as we think of it. There might be some sort of functional subordination (in role, but not in personhood or divinity), but since the Trinity itself is such a difficult doctrine to grasp, all relationships between the members of the Trinity are equally difficult to comprehend. I was led here while reading Ephesians today. My thoughts were that – as I read 3 -14 in its entirety, as was the original Greek, it seemed to me to say that perhaps Paul was saying that He and the other apostles and early followers were predestined, but that the Ephesians (and all others from then to now) became saved upon believing. I have always had a difficult time with Calvinism. I thought I would find an article that might confirm my statement above, but instead came across yours, which I must admit is a much more thought out explanation than mine. Thanks for your ministry. Thanks, Robert. Glad you found the article helpful and are able to use it in your own teaching. This has helped me tremendously. I have been conflicted over this issue for years. As a woman and mother to three children I struggle believing that Calvinism could possibly be true. How could I ever consider having children if they may be damned to hell? What a horrible thing for me to do to someone. Praise God, I came across your article. 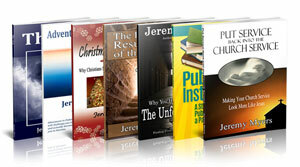 This is a great help to my Christian life, because your article gives light to this topic. God truly is gracious and just. I think with respect that your explanation attractive as it is, falls into a logic trap as regards being chosen by God for a future role. Let me start with a sentence of near Pauline length. If that is a fair statement, where does it leave Phaeroh, who not only was chosen from all time to persecute Hebrews but had to have some additional heart-hardening work done by God to stop him caving in after the angelic hitman had plagued his kingdom and slaughtered all the eldest kids ? And what about Judas, locked in for all time to a pathetic act of unnecessary identification of a very well known Jesus to the High priests police? The whole plan to torture and kill Gods only begotten Son ( and one third of the godhead ) would have gone down the drain if Judas had suddenly thought to himself ” Hey, Jude . Don’t make it bad….” Not a lot of choice there , was there ? So even before you start to quibble about ” by Christ” or “in Christ” or how some people being saved not by anything they do while others are not and how damnation by default slips around Augustines or Calvins problems you seem stuck with the trap of people being chosen from before creation to do something or other . Perhaps the whole mess is Gods will and your optimism and my profound confusion are all part of that ? Predestination, as I see it, means he planned ahead of time for all to be saved (if they choose to) because Jesus died for all the Bible says but many choose the world. Why people think they can get saved and still sin is beyond me! What a spit in Christ’s face. If that were true then his torture and death was for nothing. Shaking my head. I can never go out and sin after Christ cleaned me up. I make mistakes but I don’t believe this once saved always saved. You walk away from Christ and turn your back on him and head right back to doing the worldly stuff and think you are pleasing Christ when he allowed himself to be crusified and shed his innocent blood to cure you of the curse you were born into and this is ok? No, it is a mockery to his sacrafice.